Racing for some is a passion, for others a core business, but for Phil Hindley’s Liverpool based Tech 9 it’s both of these - but also provides an ideal opportunity to advertise the company’s skills in car preparation, the racing part of the enterprise providing “only about 25% of the business, but it is absolutely fantastic for the brand,” says the team owner. The ‘brand’ is a team of nine staff, tuning, modifying and developing already potent road cars. 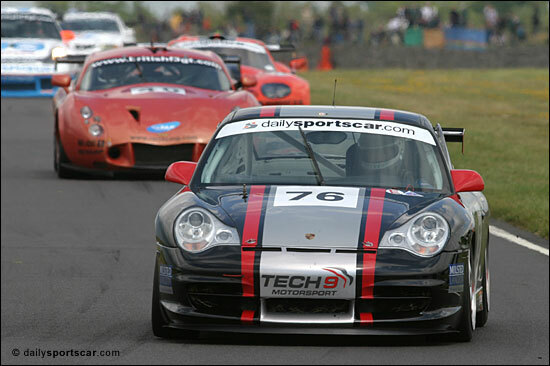 Tech 9 is the UK importer for TechArt, the biggest Porsche tuning range in the world. It’s a lucrative but highly competitive market and racing clearly gives Hindley’s concern an edge. “Our servicing operation continues to be very healthy and with the TechArt brand we prepare and modify a large number of brand new cars for customers all over the UK: our client list includes a number of famous names from the world of sport, TV and film and music. 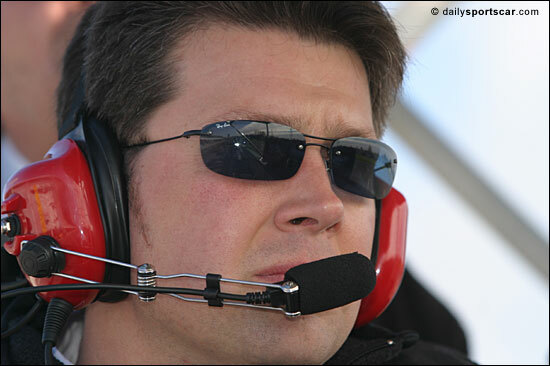 2004 though has been a far from easy season for the 2003 Cup Class champions, Tech 9 Motorsport - but Phil Hindley has never chosen an easy course, from his very early days grass track racing in 1986 / 87, through to his debut in circuit racing in 1992. The 1995 season saw a Tech 9 prepared Porsche 944 Turbo backed by air conditioning concern York International. The racing success grew, but so did tension with the championship grandees. 1996 saw Tech 9 field both Hindley and Mark Hales in Porsche 964 and 993 models respectively. It yielded nine race wins from 11 starts - “We were undoubtedly the team to beat” - but then end of season controversy saw the team thrown out of the championship on a technicality. It was a period when other preparers had direct involvement with Tech & Regs, not a combination that tolerated a newcomer treading on their toes! It was a bitter blow after such racing success and led to Hindley and Tech 9 temporarily turning their backs on Porsche racing, unhappy with the prevailing atmosphere and Championship conditions. A TVR Tuscan campaign continued into 2000, but without Hindley at the wheel – the team running customer cars. The team’s first steps into the British GT Championship were also taken that year, as Hindley reached a deal with Cor Euser to run a project with himself and Ian McKellar Jr. driving, in one of the awesome Marcos Mantaras. Tech 9 was to be fully supported by Euser’s Eurotech concern, with the Liverpool base acting as a spares hub for both the Tech9 #9 car and the Euser / Lockie #1 car. It all sounded very promising indeed, but a minor accident in Donington practice for the second race of the season saw the team withdraw from the meeting, as they were without even the most basic spares package: the promised supply had not arrived and the deal foundered soon afterwards. 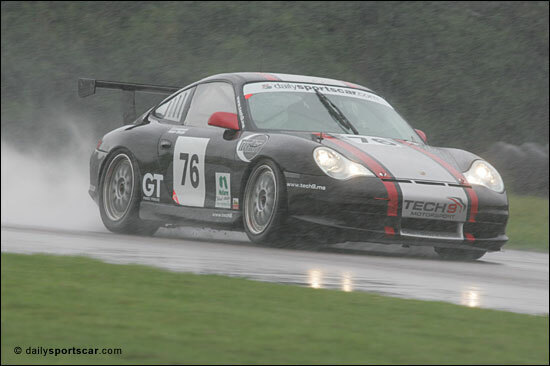 It was midway through the season before the team regrouped, running a Porsche 993 GT2 for Jonathan Rowland and Ashley Ward. 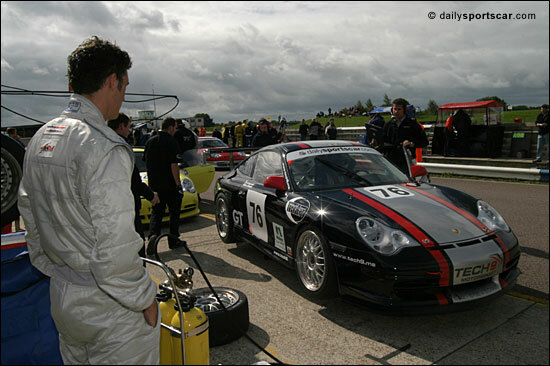 Further customer Porsche outings in the championship followed in 2001. 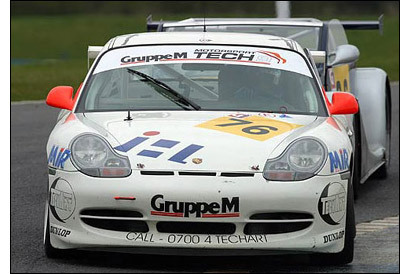 2003 saw a tie-in with GruppeM, in the brand new Cup class of the British GT Championship. The team dominated the year’s proceedings, finishing up with a title win for Matt Griffin and Patrick Pearce in the lead car (right), and a win for Tom Shrimpton, Liz Halliday and Amanda Stretton in the prestigious Spa 1000kms. Tech 9 started the new season with Kenny Chen’s GruppeM Porsche 911 RSR under its wing, alongside a singleton Cup class Porsche. By mid-season though the RSR effort was back in the hands of an in house GruppeM squad and Hindley and co. were concentrating on their efforts to secure a second consecutive Cup class title. 2004’s races are well documented elsewhere on the site. A two car entry in the dailysportscar.com Cup class at Thruxton could become a three car entry at Brands Hatch for the final 2004 Championship double header, while an N-GT car is a key part of the team’s 2005 plans. With Tech 9 wins in all three major championships it has entered, the established order will no doubt be taking a close interest in the N-GT plans of the boys from Merseyside.